Come Out and See My Movie. It’s Pretty Great. This is a New Classic in the Making. Only those who have experienced this phenomenon can understand it on an experiential level, but Love, Simon comes close to visualizing the coming-out process as the threshold event that it is. The concept of its difficulties isn’t hard to grasp, though: Not only does one come to understand the way one’s hormones work after years of feeling a disconnect from the way they “should” work, but one comes to such an understanding that the feeling then flowers into a need to tell someone. Everything, though, must be right: the time to say it, the person (or people) to tell, the courage to tell them, and the extenuating circumstances of everything leading up to that moment. It seems that such a moment is likely improbable, if not completely impossible. Something, by the law of averages, must go wrong with every coming-out moment for those who fit some initial within the LGBTQ community (and, of course, the other letters in that shorthand). If everything is right, simply because of the chaotic way the world works, that is probably going to be the exception, rather than the rule. For the protagonist of director Greg Berlanti’s film, the only right thing when the moment comes is the understanding of the person he tells. That person is the last he expected to be on the receiving end of such a revelation, the timing is far from ideal, and the place is in his car while at a stop sign. Love, Simon is about every aspect of coming out, including the unfortunate ones. 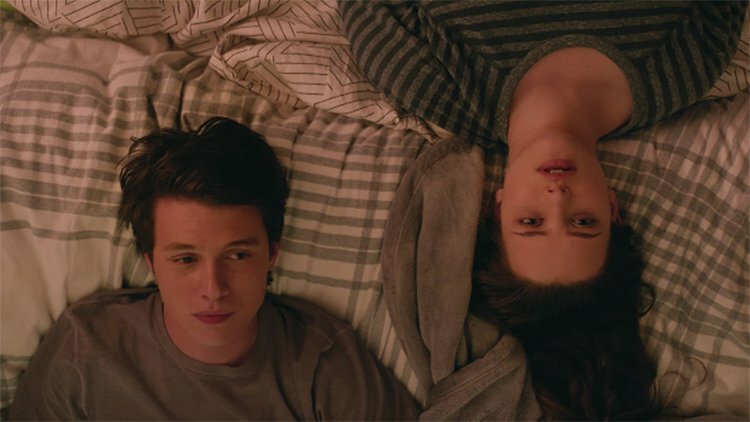 When the eponymous Simon (Nick Robinson) later reveals that he is gay to three of the most important people in his life, it is only by choice if “choice” is technically the same thing as “duress.” It’s a desperate move to get on the same page as those people he cares about before word gets out in a different, more embarrassing way. I’m getting ahead of myself, though no one should be completely surprised by the development that occurs. Given that I have already established that the unwanted acts of cruelty that often follow such a revelation are a subject of the movie, expect a character who is both cruel and callow to show up. For the purposes of fairness to readers, I will not mention that character explicitly, though I will mention in passing that it involves a blackmail scheme for the character in question to get in the good graces of the person to whom Simon first tells his secret. Abby (Alexandra Shipp) has only been a part of a quartet of friends, who also include Leah (Katherine Langford) and Nick (Jorge Lendeborg Jr.), for a few months at the start of our story. Simon, Leah, and Nick have all known each other “since the beginning of time,” according to Simon. None of them knows Simon’s secret, and meanwhile, Leah pines for him and Nick for Abby. An anonymous student comes out as gay at Simon’s school, whose headmaster (played by Tony Hale) pretends way too hard to be his pupils’ friend while also confiscating their smartphones in the hallway with too much glee, and Simon begins a series of email threads with the person in question, calling himself “Blue” and empathizing with Simon’s closeted existence. That’s when the blackmail scheme begins, and it is here where the screenplay could have spun wildly off-course, marketing in every tired trope of the coming-of-age comedy while trying to operate within the current social climate (Indeed, our President is theirs, and the older generation’s passive attitude toward a certain sexual predator when he was more famous for being a comedian is referenced). It is a testament, then, that Berlanti and screenwriters Elizabeth Berger and Isaac Aptaker (adapting a novel by Becky Albertalli) avoid all these trappings for a more honest and compassionate view of everyone (except that pesky blackmailer, who might play too big a role for being a device to rile up the emotions) who is an active presence in Simon’s life. When the revelation occurs more immediately and publicly than Simon wants, other consequences – some of them reflecting upon him poorly – occur but not in a way that seems to punish Simon for his sexuality. Instead, it exists to illustrate the spider-web of consequences that can come from such acts of cruel opportunism. The film also pays careful attention to Simon’s home life. His father (played by Josh Duhamel) cracks casually homophobic jokes in a way that suggests he probably doesn’t mean or understand a word of them. His mother (played by Jennifer Garner, who gets to reaffirm her love for her son at a crucial, cautiously performed moment) is proudly liberal, refusing to shelter her kids for the sake of arbitrary family values. His sister (played by Talitha Bateman) cooks meals of questionable quality on her way to becoming the next top chef who will not be chopped. Once the revelation hits home, the filmmakers take advantage of the opportunity to see a decent family processing a huge truth with rare honesty. Robinson’s performance more than simply anchors the film. This is a compelling portrayal of internalization that explodes into deserved angst only when necessary. It’s a great performance from an actor who is likely to have (if we are lucky to be blessed this way) a storied career on the evidence of this role. Love, Simon is a heartfelt surprise, a coming-of-age tale that doesn’t coast on the clichés of its genre but embraces them, melding drama with some genuinely funny high-school comedy into a special thing, indeed.